About GUESS THE COLOR GAME! I will be doing this game daily. The game will show a picture I took myself. It will be filtered 3x (three times) and the last filter is BnW or Black and White. In that way the original color is concealed. Then an object in the picture will be highlighted in focus. The task then is to guess the original color of that object. If the object is multicolored, the most dominant color is the one we are after. The object in focus is the flower as you can see, so you have to guess the color of it. After 7 days, the original image will be revealed. The person or persons who got the right answer will take 50% of the SBD payout, while the rest of the participants share the 50%. In this example, the winning answer is pink. Important note: All images I will be using are my own and not searchable from anywhere online. Easy, right?!? It is easy. Just answer and forget about it and in 7 days you will have a prize. Now, I do need support. I need your help to be able to help many others through my contests. I do not require or demand upvotes and resteems for any of my contests but I am asking you to help support me any way you can, it's up to you. A post has a 7-day period until payout, please consider supporting any time in that time frame, if you can. I understand VP can be exhausted but I hope you can share something for everyone who will be participating in this game. I am certain that the success of this game will be based on the appreciation it gets from the people who will support it. I am humbly asking for your support for me to be able to keep this going. I am not initiating this just because I want to, but because I want to be here and matter and do something for Steemit and my fellow planktons. Also, to let people engage and to make the platform even more fun than it is already. Guess the color of the cap of the tumbler that's highlighted. Have a nice day and thanks for joining. BTW, I have a new token in the Bitshares Exchange, the token is called VAMPYRE, it's a game token that will be tied to contests, causes and gaming. If you don't have a Bitshares (A Decentralized Exchange) account yet please make one using my referral link for free here and we have a Discord here: https://discord.gg/HXjdWjy Thanks! All my game contestants will be distributed tokens soon. You need to comment below with your answer, just the color and only 1 color per person. If a number of people answered the winning color, all of them will split the 50% reward of the payout. The rest of the participants split the other 50%, AGAIN, NO LOSERS. If no one guesses the right color, 75% of the payout will be shared by all. 15% goes to app development of a dev that MMV (@mermaidvampire) supports and 10% goes to MMV's kidney transplant fund. 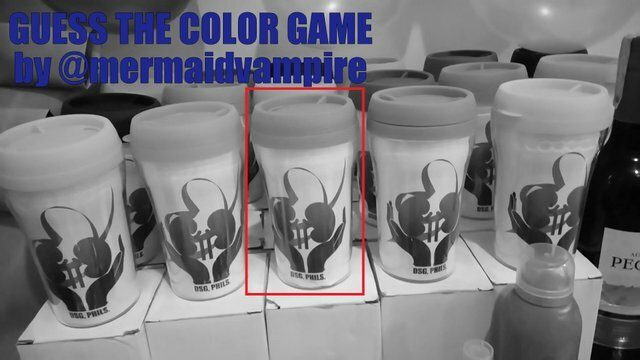 The decision of @mermaidvampire as to what color she perceives is the color of the object in focus is final and indisputable. You can guess any color there is in the color wheel, from primary colors, secondary colors or compound colors, etc. Wanna earn SBDs easy? Join now and win it. Don't miss out on the chance to get SBDs easy by joining @mermaidvampire's NO LOSER contests! Check my friends' contests:@vdux, @izaid, @atongis, @zephalexia, and @travelsbyblue. Any concerns, questions, suggestions, you may comment below or send me a memo in my wallet. Thanks! Congratulations @dzoji! You have received a vote as a way to thank you for supporting my program.